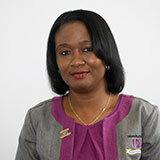 The Department of Human Resource Management is managed by Ms. Hertha Gentle. Ms. Gentle possesses a Masters of Arts (M.A.) in Labour Economics and Human Resource Management from Chulalongkorn University in Bangkok, Thailand. She can be reached at hgentle@ub.edu.bz. Prior to joining the UB family, Ms. Gentle worked for the Government of Belize – Labour Department where she served in various capacities including Senior Labour Officer and Deputy Labour commissioner (Ag.). Ms. Gentle has over sixteen years of expertise and experience covering both strategic HR management and labour relations. She also works as a part-time Lecturer in the subject areas of Human Resource Management and Organizational Behavior. She has facilitated several training sessions and consultancies in the area of Labour Law, Discipline in the workplace, Human Resource Management and Workplace Productivity. Creating a cost effective, comprehensive and competitive compensation and benefits program. Ensuring a high performance culture by providing professional and personal development, training, and continuing education to employees to promote individual success and increase overall value to the organization. Providing a safe and healthful working environment that welcomes and values the diversity of our employees. Establishing, administering and effectively communicating policies, rules and practices that treat employees with dignity and equality while maintaining compliance with the labor laws of Belize.